With Sailthru’s Audience Builder, you can easily harness the wealth of data across user profiles using a wide range of highly customizable criteria. For any groups of users that you identify, create Natural Lists or Smart Lists, view ad-hoc user Snapshot Reports, and make bulk updates to users’ vars or email opt-in/validity statuses. See What’s New? for details about Sailthru’s latest Audience Builder release. You can perform the following actions based on the users you match. You’ll select an action from the bottom bar after you’re done setting up your user-selection filters. Note: After you select your action, you’ll be able to enter a name for your list. You cannot use a dollar sign ($) in list names. 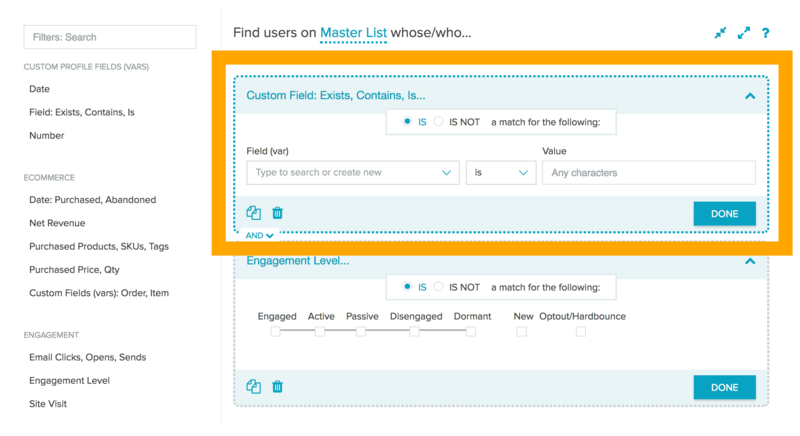 Save as Smart List – The Smart List will perpetually update to include the users who match the filter criteria. 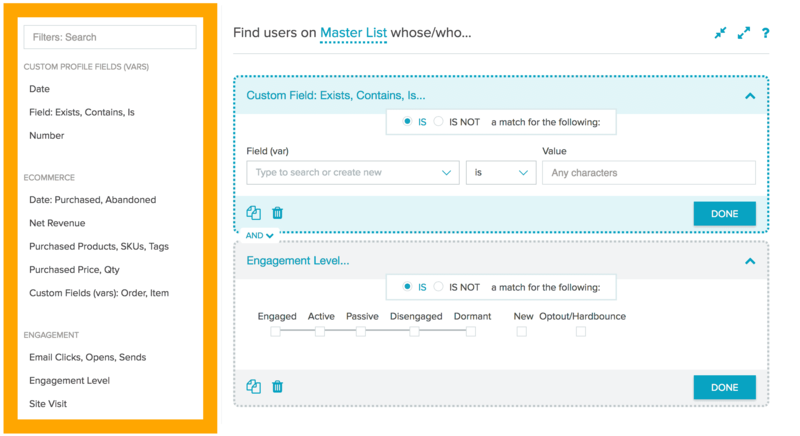 Generate Natural List – Create a Natural List of all users who currently match the audience you have defined according to your filters. Snapshot Report – Generate a report about the matching users, with insight into their geography, interests, activity, engagement, and more. Bulk Update Profiles – For all users who match your filters, add/change a var value or email opt-out/validity status. Note that numerical values will be stored as strings, and will therefore only be matched in future Audience Builder queries if the searched number is placed in quotes. If you need to bulk update with a numerical value, please use a list file upload or the job or user API. One or more lists – When this option is selected, click the List name(s) field to search and select from your natural and smart lists. All primary natural lists – Use all natural lists that are marked as primary. All users in database – Use with caution. This option includes all users ever mailed, uploaded, or stored in your account via API calls such as purchase, user, or send. Not all of these users have opted in to campaign mailing, and must not be messaged without consent. If you select Start future audiences with this source, you will skip this screen in the future. For details on each filter, see the Filter Reference. In the left pane, click a filter’s name to add it to the display. In the filter, enter criteria for the users to include or exclude. To include matching users, select IS. To exclude them, select IS NOT. When you have entered valid criteria, the dotted border around the filter is removed. If the entire filter or an individual field turns red, the criteria you entered is not valid and must be corrected before saving the filter and performing your action. Click Done or collapse the filter using the icon at top-right . The filter is minimized for easy dragging, dropping, and reordering. To delete a filter, while it is expanded, click . Repeat the instructions above to select and configure one or more additional filters, or click copy on an existing filter to start with a duplicate. Click or to switch the logic connecting all filters or filter groups that exist at the same level. Click and drag a collapsed filter on top of another to join them in a group. When the destination filter turns blue, drop the dragged filter. The two are now grouped. You can change their logical operator (AND/OR) independently from the one that connects the group with the other filters. You can also create a second level of groupings, where a group is nested inside another group. You can add a “NOT” logical operator to a group or subgroup to exclude users who match the result of the group. Hover over the grouping bar, and click IS to change the operator to NOT. To remove a filter from the group, drag it just outside the group until a dark box is displayed to preview the new location. When creating an A/B test, you may wish to use a holdout or control group of users not receiving a specific message. This is useful when you’re running a test to see how many users will respond to an offer. For example, if you’re testing against disengaged users, group A could receive an email with an offer, group B could receive an email with no offer, and the control group would receive no email. With this setup, you’ll be able to see how many disengaged users return with no offer or contact. Select your Source List. This can either be a list filtered from All Primary Natural Lists or any single list that contains the full set of users you want to include in your test. Select your list filters, if you’re using them. From the Actions Bar, select Other Actions and then Generate Natural List. The Generate Natural List editor opens. Enter a List Name, for example, Test – Control. Limit the list size by a percentage (for example, 20%). Follow steps 1. and 2. for creating your control group. Select the same list and filter options as you did when creating your control group. Add the Natural and Smart Lists filter. Set it to IS NOT on these lists. Select your control group list from the dropdown. From the Actions Bar, select Save as Smart List. Enter a List Name, for example Test – Variable. Under Criteria, select “Is not a member of list,” and in the Value field, enter the exact name of your control group list. You’re set up to create an A/B Split Test. Use the Test — Variable Smart List as your Audience.